CAMP ZAMA, Japan (Jan. 18, 2019) - The entire Camp Zama community is urged to participate in the Jan. 23 earthquake preparedness "Shake Out Drill," according to U.S. Army Garrison Japan officials. It's no secret that Japan is an earthquake-prone country. 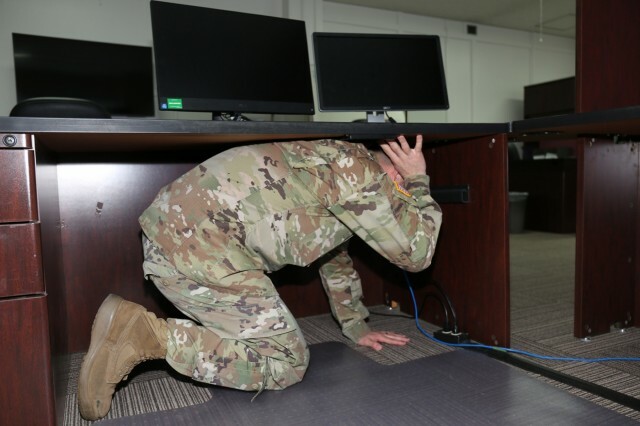 The 4.9 magnitude earthquake that hit about 100 miles north of Camp Zama on Jan. 14, rattling the ground a bit here, served as a reminder of the importance to be prepared. According to Camp Zama's Directorate of Plans, Training, Mobilization and Security, 1,338 strong earthquakes, magnitude 5.0 or higher, have occurred in Japan since 2008. "These events are happening all around us with enough frequency that we can't afford to be complacent," said William Luna, Camp Zama's installation emergency manager. "We need to practice so when it happens we are prepared." USAG Japan and Zama City will simultaneously conduct the Shake Out Drill at 11 a.m. on Jan. 23 throughout its installations and the city. For added realism, a one-minute video will play on the Commander's Access channel, and an emergency exercise message will be sent through the AtHoc emergency notification system. During the drill, residents are reminded to practice how to "drop, cover and hold on." When an earthquake hits, drop down onto your hands and knees, cover your head with your arms to protect yourself from falling objects and seek cover, and hold on to any sturdy covering until it stops. Luna said some people freeze and aren't sure what to do during the stress of an earthquake. But by practicing "drop, cover and hold on," people will build muscle memory and there is higher likelihood that they will escape that earthquake without injury. "It only takes a minute to practice the steps," said Luna. "Practicing will save lives if we ever have major earthquakes. And it's not if it will happen, it's when it's going to happen." Luna said we have to make sure that we are ready and that the community is prepared should major disaster strike us.